On the final day of the American Legion Post Baseball regular season, the Waverly Post 142 team had a chance to force a tie atop the regional standings and steal the top seed in the upcoming regional tournament. 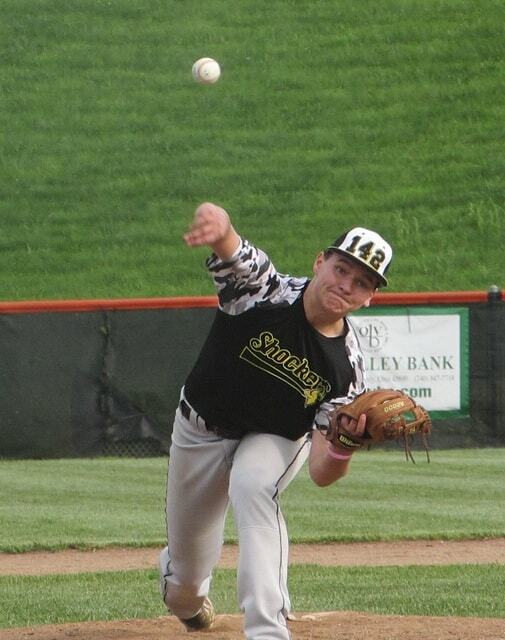 Instead, injuries and fatigue caught up with the Shockers, and Yeager Post 199 (Harrison, Ohio) clinched the Region 5 regular season title with a 15-1 victory at Waverly High School on Thursday evening. “That score is a little deceiving. We’re out of arms, they’re not. We’ll learn from it somehow,” Shockers coach Jonathon Teeters said. Post 142 clinched no worse than a second-place finish with a 5-4 win over Circleville Post 134 on Wednesday night. Oak Hill pitcher Shane Spriggs came up with a two-RBI double in the top of the sixth inning to give the Shockers the victory. After Yeager defeated Circleville in an early game at Waverly High School on Thursday afternoon, it set up a de-facto championship game for the number one seed in next week’s regional tournament. A Yeager win would clinch the top seed outright, a Shocker win would force a coin flip to decide the region’s champion. The Shockers started out strong, as Minford senior Jared Alley pitched Post 142 to a scoreless first inning. But things quickly unraveled from there. “I noticed in the middle of the (first) inning that he had lost some gas on his ball,” Teeters said. Teeters removed Alley from the game after the first inning due to a sore arm. He finished the game at first base and went 2-for-3 at the plate. “I didn’t want to chance anything. At this point in the game it’s not worth it,” Teeters said. With Alley’s day on the mound done, Waverly handed the ball over to Oak Hill’s Shane Spriggs. Considering the circumstances, Spriggs pitched admirably but didn’t get much help from his defense. With two runners on and one out, a Shockers’ infield error turned what could have been a double play into loaded basepaths. After an RBI single gave Yeager its first lead of the day, Waverly seemed to secure the second out on a suicide squeeze. However, no Shockers were covering first base after fielding the bunt, leaving all runners safe with a 2-0 Yeager lead. One batter later, a second Shocker error gave Yeager their third run of the inning. An inning later with the Shockers already trailing 4-0, a third infield error erased another double play ball and opened the door for another four-run inning. All of a sudden, Post 142 found themselves in an insurmountable hole. Waverly also struggled to generate offense against Yeager pitcher Jarod Drewes. Portsmouth graduate Sky Oliver scored Waverly’s Joe Henderson from third with a productive ground out in the second inning, but that was the extent of the Shocker scoring. Despite the loss, Shocker catcher and Minford graduate Dylan Shockley continued his hot streak, going 2-for-2 with Post 142’s only extra-base hit. The Shockers will take the weekend off before beginning postseason play on Monday in the American Legion Regional Tournament. They will play either Circleville Post 134 or Chillicothe Post 757 in the second round of a double-elimination tournament on Monday at 6 p.m. at VA Memorial Stadium.